Connor Craig was in dazzling all-round form for Nassington at Oundle. Bourne have been knocked off the top of Rutland Division One for the first time this season. 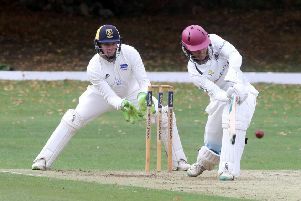 Nassington have moved through into pole position after their 59-run win at Oundle yesterday (April 28), while the long-term leaders were losing by two wickets to local rivals Bourne. Ben Peck claimed 6-36 for Stamford at Ufford Park. Nassington now lead the table by seven points with just two matches to go. the first of which is at home to Bourne next Sunday (September 4). Captain Peter Morgan cracked 75 of Bourne’s 219 and his side looked well on the way to victory when Deeping slumped to 125-7. But the visitors to the Abbey Lawns held some big guns back and Dave Gillett, batting at number nine, saw Deeping to victory with an unbeaten 48. Tom Andrews batted an number eight and struck a crucial 33. Conor Craig was the star of Nassington’s comfortable win at Milton Road. He top scored with 53 of Nassington’s 212 and then took the first four Oundle wickets to fall on his way to figures of 4-26 as Oundle replied with 153. David Gillett scored a crucial unbeaten 48 to help Market Deeping beat Bourne. Deeping’s win has moved them 15 points clear of the relegation zone with three games to go. Rock-bottom Uppingham, the reigning Division One champions, are doomed to the drop and Ufford Park are favourites to join them after a two-wicket reverse at the hands of Stamford. Ufford looked set for a mammoth score while top men Ross Keymer (91) and Andy Larkin (55) were going well, but Ben Peck’s 6-36 stopped the home side in their tracks. A total of 212 was still decent, but Stamford got home with four balls to spare thanks mainly to Simon Lem (75) and Suneel Appan (51). Upay Bopadra (4-32) bowled well for Ufford. Peterborough Town’s match at Wisbech was abandoned with five overs to go because of bad light. Town were 146-6 chasing 175-9 when play was halted. Oundle and Division Two side Grantham were contesting the John Wilcox Trophy Final at Barnack today (April 29). Ufford Park and Stamford were renewing their rivalry in the Plate Final of the same competition at Ufford. Bourne 219 (P. Morgan 75, S. Evison 43, B. Stroud 40, T. Dixon 35, Z. Simmonds 3-42, J. Smith 3-44). Market Deeping 223-8 (D. Gillett 48no, T. Andrews 33, J. Morgan 29n, J. Smith 25, P. Brown 25, J. Berry 3-43, T. Dixon 3-48, B. Collins 2-53). Nassington 212 (C. Craig 53, D. Bandaranaike 29, J. Pope 26, J. Bolsover 4-42). Oundle 153 (P. Wilson 29, M. Hodgson 27, B. Weatherington 22, L. Northrow 21, C. Craig 4-26, M. Cordeiro 2-23). Ufford Park 212-9 (R. Keymer 91, A. Larkin 55, C. Lightfoot 29, B. Peck 6-36). Stamford 213-8 (S. Lem 75, S. Appan 51, U. Bapodra 4-32). Wisbech 175-9 (J. Bowers 45, R. Howell 38, J. Hargreaves 36, C. Parnell 3-35, K. Singh 2-30, J. Smith 2-40). Town 146-6 (K. Judd 53, K. Medcalf 33, C. Milner 25, K. Haynes 3-41, S. Rippington 2-34).